I was at the Lake Superior Libraries Symposium last week talking about the digital divide. The theme was “bridges” which was perfect because “librarians bridging the digital divide” is the subtitle of my book, now three years old. The talk was a variation of the talk I gave in Michigan, plus it had slides. You can check it out here: Bridging the Digital Divide. I had a wonderful time in Duluth and have to thank the organizers for putting on a really excellent one-day symposium. 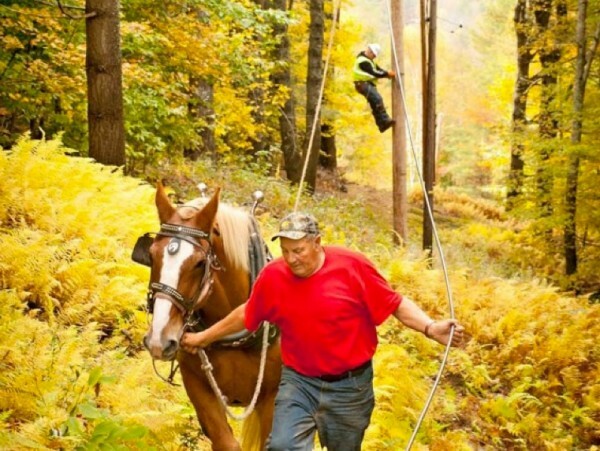 This image, though it looks super old timey, is actually from late 2012 and is what it look like: two guys laying cable through the woods using draft horses. It’s a very dramatic image just because of the colors but I think it also shakes people up a little “Wow, there really are places in the US that aren’t there yet….” I talked a bit about the culture of learning new things and about our roles as not just teachers but emulators of good technology practices. And it was timely because I’ve spent this week enmeshed in terrible, confusing, and poorly designed websites as a result of a job shift. I’ll talk about this more in a separate post, but in an effort to get more librarianing in my life, I’ve moved on from MetaFilter and taken a small job at the Internet Archive working for Open Library. This involved a shift in health insurance and possibly some unemployment payments (going from full-time to part-time). And, since this sort of thing is all done digitally nowadays I’ve gotten to experience first hand what it’s like to feel beaten down by technology when you feel like your money or your livelihood is dependent on it. I am fine, nothing is wrong with me, I have health care and am still well-paid, but the creeping dread that came over me when I was worried “Did I fill this out correctly?” “What does that phrase mean?” “Why isn’t this Submit button working?” and the inability to get timely help or support via the website (I seemed to always start these processes 20 minutes after the phone support ended for the day) just made me frustrated with our culture of bad technology and poor user interfaces and made me sad for people less savvy than me having to navigate these waters and being worried that maybe the problem was them. As always, we have so far to go. Congrats on the new gig. Looking forward to hearing more about it! Thanks again for your engaging, enlightening talk at LSLS this year! I did get a chance to thank you in person, but not to mention how impressed I have been with your work on MetaFilter. Perhaps it’s a stretch, but I consider reading AskMe professional development. Thanks again, and best wishes for your future endeavors, particularly with Open Library.